Despite social and economic advances around the world, poverty and disease persist, exacerbated by the mounting challenges of climate change, natural disasters, political conflict, mass migration, and economic inequality. While governments commit to addressing these challenges, traditional public and philanthropic dollars are not enough. Here, innovative finance has shown a way forward: by borrowing techniques from the world of finance, we can raise capital for social investments today. Innovative finance has provided polio vaccines to children in the DRC, crop insurance to farmers in India, pay-as-you-go solar electricity to Kenyans, and affordable housing and transportation to New Yorkers. It has helped governmental, commercial, and philanthropic resources meet the needs of the poor and underserved and build a more sustainable and inclusive prosperity. Capital and the Common Good shows how market failure in one context can be solved with market solutions from another: an expert in securitization bundles future development aid into bonds to pay for vaccines today; an entrepreneur turns a mobile phone into an array of financial services for the unbanked; and policy makers adapt pay-for-success models from the world of infrastructure to human services like early childhood education, maternal health, and job training. 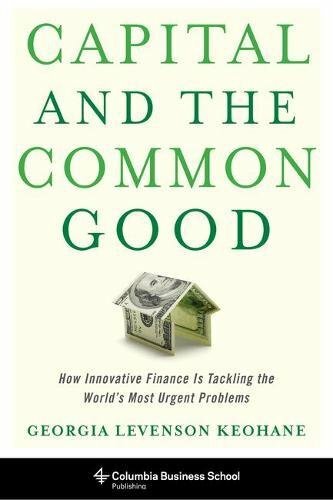 Revisiting the successes and missteps of these efforts, Georgia Levenson Keohane argues that innovative finance is as much about incentives and sound decision-making as it is about money. When it works, innovative finance gives us the tools, motivation, and security to invest in our shared future. Preferred Stock Investing, 5th Ed. By Wellesley Investment Advisors, Inc.